The lists are out, the shelves are stocked and it is nearing the beginning of another school year. For some, you may be shocked to see that your child went up not one but two shoe sizes, or their jeans suddenly became capris over the summer and you aren’t quite sure how that happened! With all of the school supplies and clothes you are setting out to get, I thought it might be a good idea for us to remember some other supplies our kids need when preparing for the new school year. There is certainly a spiritual battle going on. Spend some time talking with your kids about the armor of God and what each piece of the armor signifies. Pray with them through each piece and remind them to put it on each day. No matter how old, a child can make a big difference in another’s life. Talk with them about keeping a lookout for someone who is struggling. Encourage your kids to watch for someone who is sitting alone at lunch or who is being picked on. Remind them to say please, thank you and open the door for others. Tell your kids about the gifts and talents they have. Encourage them to set goals for themselves for the year. What do they hope to accomplish? What are they looking forward to? Encourage them to be on the hunt for good things even on bad days. At our home, during dinner time, the kids are asked what the best thing was that happened that day. Of course there are some rolled eyes at first because they know it is coming, but even in their bad days, I won’t let them off the hook. We must always be on the hunt for a blessing even in the storm because there always is one. I am serious about this one. Get an alarm clock and have it wake your kids up instead of their cell phone alarm. Kids need rest and those darn cell phones will light up, buzz, ding, vibrate and ring all night long. Just because their friends feel like it is ok to send a snap at 2am, doesn’t mean you need to let it happen. Make a charging station and have your kids turn in their phones. (I don’t necessarily recommend it is in your bedroom unless you turn it completely off, otherwise, YOU will be up all night.) Often times, lack of sleep can bring out feelings of depression. Sleep is gold and it is important that we do everything we can to make sure our kids get enough rest. Make a habit of praying with your kids. Pray for their school year, their day, their friends, and their teachers. When things get tough or things are going well, remember to bring God in as a source of strength. 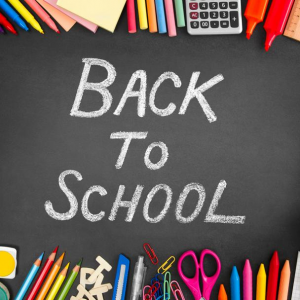 We hope all goes well for you and your kids this school year! If things get tough, remember we are here for you and will help you navigate some of the challenges that can come up for families. Interested in meeting with Dondi? Click here to schedule a session today!